Earlier this month I woke up to some GREAT news from Lisa Fraley Legal Coach LLC. 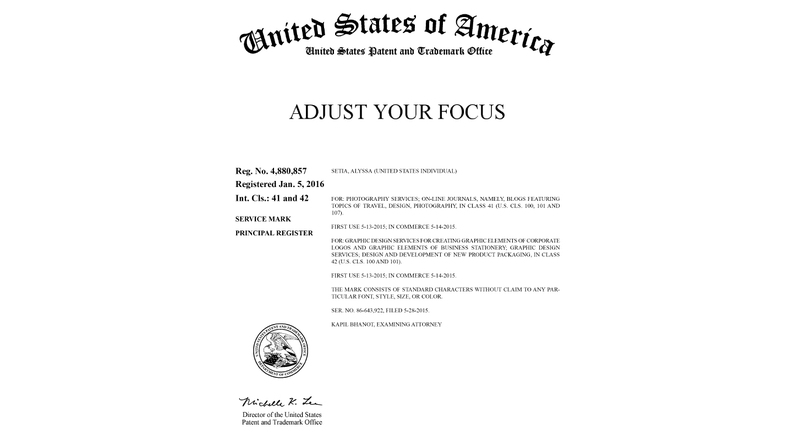 Happy to say that after almost a year of working on this it’s official… my trademark for “Adjust Your Focus” was granted by the USPTO!! 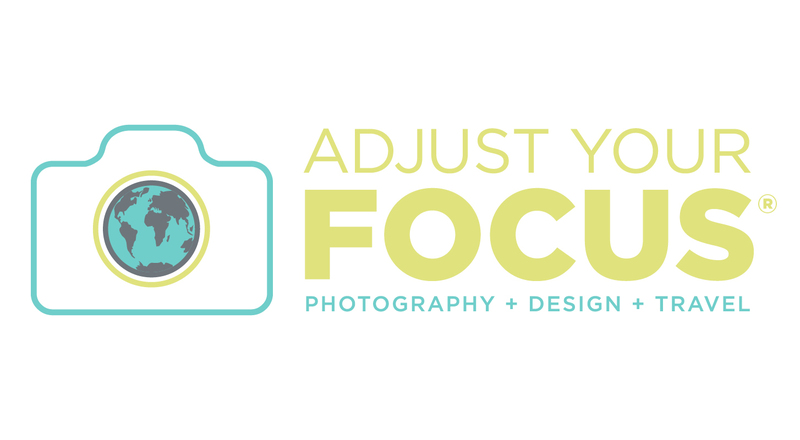 Adjust Your Focus® is now registered for 10 years! When I announced that on social media, several people reached out asking why I decided to trademark and how was the process. It was a big investment, and decision, but I’m glad I went for it. Hopefully this post will answer any questions you have about trademarking. Registering a trademark gives you important legal rights and ownership. Attending my first travel conference (WITS15) back in March left me inspired, motivated and confident. My current site alyssa setia photography + design needed to change but I wasn’t sure what it would evolve into. Notebooks were filled with possible new names and tag lines yet nothing seemed to really jump out and stick. During my time at WITS I met a lot of incredible ladies, many who were in similar situations with either branding for the first time or rebranding. Numerous times I heard things like, “my focus is changing” and “I need to adjust what I’m doing”, which was true for me too… and bam, a light bulb went off: Adjust Your Focus! Towards the end of the conference, I mentioned this concept to a handful of people and their response what powerful. Every single one said it was a great idea and some even said it was genius and wished they had come up with it. Catrice, a speaker I connected with right away, was one of the people I told. She mentioned she was thinking about trademarking herself and that I should definitely look into it. I have to thank Catrice for connecting me with Lisa Fraley, who was amazing to work with (but more on that later). I knew Adjust Your Focus® was perfect, for rebranding now AND growing in the future. That’s key. It took lots of work to come up with a name that really encompasses my passions: photography + design + travel. The name relates to photography from a literal standpoint but also is open ended when it comes to life. Returning home I went to work on my vision, resulting in the launch of Adjust Your Focus® in May 2015. Along with designing the logo and website, trademarking was something else I focused on. The name, and logo, is the hardest part of branding. It needs to be timeless. There has to be room for growth. As you and your brand evolve, the name needs to match. For me, I wasn’t focusing on just photography or just design or just travel, but instead wanted to come up with something to combine all three. That was not an easy task, so when that light bulb went off at WITS I knew it was something to invest in. Many other creatives could easily use that name as well, which is why I decided to trademark. Those three words have so much meaning, and so many different meanings, that I connect with. I’m proud of it and know I won’t outgrow the name. How can I? The name itself allows you to keep adjusting and growing. Apply yourself or use an attorney? Soon after the conference I contacted Lisa and we chatted over a 20 minute free consultation. At this point I wasn’t sure how much to invest, and whether to try trademarking myself vs use an attorney. Like all businesses starting out, it’s finding that balance of what to spend money on in the beginning and what to save for later. There were so many questions racing through my mind and talking to Lisa was wonderful. Not only was she helpful, experienced and willing to answer all my questions (chatted much longer than 20 minutes) but Lisa also really took time to ask about me, my vision and why I was thinking to trademark Adjust Your Focus®. She also said it was genius and could tell there was a lot of thought and passion involved. If I wait until more income is being generated to get this process started, in the meantime someone else could be coming up with a similar idea. If I find out the name has then been trademarked by someone else would I regret not beating them to the punch? Would I be upset over losing the rights? How much of this name is a part of me? Do I really see this sticking with me for a long time. Can it continue to grow and evolve, or will I be stuck down the road? I answered yes to all the above. Ask yourself those questions if you’re thinking about trademarking. The process is long, and you are 50% more likely to have it granted if an attorney is involved. After a lot of contemplating, I decided it was worth trying to get the trademark granted and to use an attorney. Lisa and I got right to work on her 2 step process. This is the most important step because a thorough search is needed to find conflicting or similar marks that could deny your trademark. Yes, you can do a database search yourself but this search is way more extensive. An attorney will have access to software and resources that you don’t. It doesn’t make sense to file a trademark application if someone else already has the same or similar trademark. As I learned, when you apply there are also different categories, or classes, you can trademark something in. My trademark is for multiple classes covering a wide range of topics and services. Lisa ran the search and gathered more information about how I was planning to use it and what categories made sense to have covered. Waiting for her call about the results was what I was most worried about. Yes it would be good to know if there was a conflict before starting the rest of the process but that would also mean I had to start over, coming up with a new name. To be honest, I was surprised it wasn’t trademarked already (lucky for me!). After discussing what Lisa found during the trademark search, we determined it was worth continuing on with the process. Preparing and filing the trademark application was the next step. I had to fill out an application prep sheet, which answered some questions and attached samples of how the name was already in use (logo, stationary, website, etc). The more proof the better. Lisa put the trademark application together and filed with the USPTO. After that it was a waiting game… like almost a year of waiting. There was ongoing communication and monitoring the whole time. A few times things did come up that required me to provide Lisa with more information but after that she took care of everything. Throughout the process she also shared some tips and ideas, that I wouldn’t have thought of, to help move the process along. Things like changing some of the wording on my site and adding the TM symbol after Adjust Your Focus® everywhere. From dealing directly with the USPTO to continual guidance, communication and help throughout the long process I will say I am very happy I decided work with an attorney and can’t say enough good things about Lisa. Honestly. Whether you’re interested in trademarking or other legal protection, I recommend checking out this incredible legal coach® & attorney. The trademark process is an investment of time, energy and money. It isn’t cheap and can be a long process (up to 18 months). Working with an attorney significantly helps your chances, but unfortunately getting the trademark approved isn’t guaranteed. This is a tricky question. No matter if you’re a blogger, creative, entrepreneur, etc. really think about what it is you want to trademark. If the name is so specific to you and your brand, do you see others using it? If no, it might not be worth trademarking then. If it’s like Adjust Your Focus® however, where a wide range of people could easily use that name, it might be worth trademarking. For me it was and I’m so grateful it all worked out and is officially registered! It’s a personal decision. Think about the questions I asked myself and be honest with yourself. Why is it you’re thinking about trademarking and how invested are you? If you answer yes to the questions like I did, it’s worth acting on. Don’t risk waiting for someone else to trademark the same or similar idea. Yes, it is an investment but if granted, you are covered for 10 years! There are several people using Adjust Your Focus® on different social media accounts and now that I have it registered, Lisa and I are currently coming up with a plan/how to act on it. This was a longer post, hopefully it answered some of your questions and was helpful. Are you thinking about trademarking? Have you gone through this process? I’d love to hear from you, comment below. As Lisa always says, here’s to getting legally covered! Hey, this is enlightening in a way! I never considered the idea of trademarking and you’ve given me some really good ideas to think about! You really do have an awesome name and that’s got to be a relief to know it’s not going anywhere! Thanks for breaking down the process and helping take away some of the question marks involved with trademarking! Congrats!!! I need to look into probably doing something similar for my own brand, though we’re in Australia now so I’m guessing it would be similar but probably a slightly different process than that of the US. I hadn’t even really thought about Trademarking my brand before now, so thanks for the great idea! Trademarking is one of those things that is easy to overlook, especially starting out, but like I mentioned if it’s a name you are really proud of (and others could potentially use), it’s worth going after in the early stages. Definitely a personal decision but something to think about. Thanks for sharing Meg. Hmm something to really think about! Great that you went through it and let us all know so much. Thanks Holly, hope it was helpful. Congrats! I agree with doing this 100%, especially if you plan on making it into a business venture. Nice name. I love the double meaning and I’m a fan of clever, imaginative and visual word play. I never thought about trade marking and I’m now wondering what the process would be like here in Canada. It’s worth looking into though, thanks for the wonderful and informative post! Thank you Christopher! It’s definitely a name that I’m proud of and can grow with. I’m not sure the process there but always worth looking into. Once you have the facts, then you can decide if it makes sense for you to pursue. Alyssa! You did such a beautiful job of outlining the trademarking process and the often-asked question of whether you should do it alone or with an attorney. I was so honored to work with you and BEYOND THRILLED that you took these steps to register Adjust Your Focus® as it so beautifully captures your brand, your essence and your many incredible talents. Thank you for letting me guide you through the process as your Legal Coach® and Attorney. It is my passion to be able to help entrepreneurs protect and support their businesses and brands by taking the right legal steps at the right time. I am always open to answering questions about trademarking and helping people know it it’s the right time for them to trademark. That’s why I offer free 20-minute Legal Chats at http://lisafraley.com/legalchat. Lots of Legal Love! Alyssa, I’m so glad it worked out for you! Congratulations! Thank you for introducing us Catrice! I’m so glad it worked out too.